Oh hey! It's been a minute! I hope everyone is doing great and has had a fab summer so far! We have been living up every moment and not looking forward to the end of summer nearing. I will say, however, I always get the itch right about this time of year to start wearing my fall clothes. All the new fall lines are starting to come out in stores and of course, fashion week is coming up quickly, which means it won't be long before we are wearing sweaters and boots again! We even had a few days this last week that made fall clothes necessary which brings us to today's look! That hat and that bag are on my wishlist! awesome pics, love your jeans and your style, nice bag, looking pretty. Ravishing, marvelous, nice outfit. love your smile. 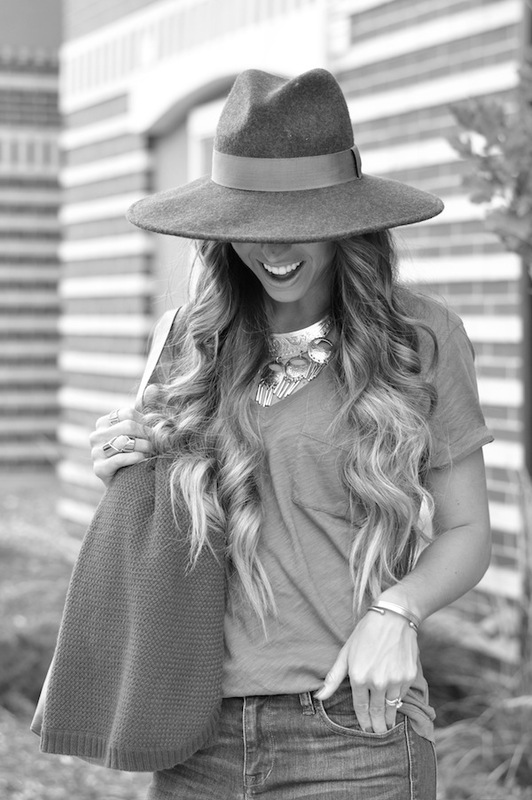 This outfit makes me so excited for fall :) I love that hat! Perfect look for early Fall!! Love your casual chic sweater! !